Silver Linings is a new program designed to assist seniors and families coping with Dementia and the early stages of Alzheimer’s disease as well as seniors living with physical impairments. 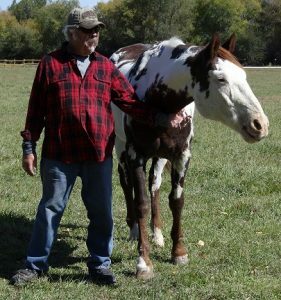 Couples can participate together or as individuals in a unique program that harnesses the healing power of older horses, along with a skilled therapist to improve the quality of their lives. Recent studies have shown tremendous promise and we hope to help pioneer this program in Colorado. This will give older horses and older humans a chance at friendship, companionship, understanding, purpose, connection and healing. Caregivers or spouses can either participate with their loved one or they can take some time to sit under our giant willow tree, relax in the shade, enjoy some iced tea and read a good book in a peaceful relaxing setting. Your donations will help us to launch this program in 2018.